Big US fast food chains like McDonald's, KFC, Pizza Hut and Burger King have all sorts of awesome products and promotions in other countries, and Huai Bin of the infamous Malaysian blog sixthseal.com does a great job of keeping track of the ones available in his neck of the woods. My favorite product names are the KFC Tom Yam Crunch, Starbucks Coffee Jelly Frappucino, McDonald's Prosperity Burger Chicken and Prosperity Desserts, Pizza Hut Ocean Tempura King Prawn, Bubur Ayam McD (McDonald's Chicken Porridge), and the KFC Curry Crunch. Mercats de Barcelona. My friend and favorite photoblogger Rion Nakaya was in Barcelona recently and wandered through one of the city's many markets with her camera. There are lots of other gorgeous photosets on her site; of the many food-related ones my favorite is of Tokyo's Tsukiji Fish Market. Top Madrid Chefs Draw Inspiration From a Catalan Star. Jonathan Reynolds visits Madrid and finds Ferran Adrià's spirit of scientific experimentation doing well in the city's restaurants, some of them run by his acolytes. This weekend I traveled to Sausalito, California to practice the art of leisure. By all accounts, it was a success. One of my favorite meals from the weekend was a late lunch at the Salsalito Taco Shop. Earlier this month, I spent a weekend in Austin, Texas attending SXSWi, and of course, eating. Here's a quick report of some the restaurants I visited. Enjoy! 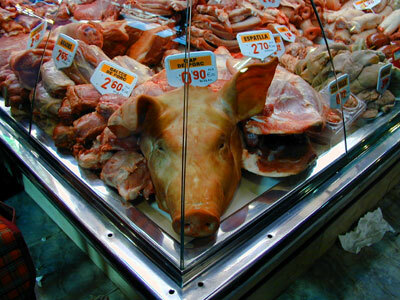 * Styles of barbecue vary widely, but Central Texas barbecue tradition is heavily influenced by the influx of German and Czech settlers in the late 19th century and their tradition of sausage and smoked meats. 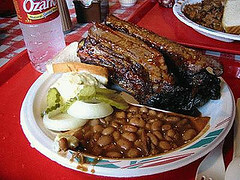 Beef brisket figures prominently in Texas barbecue -- I, however, threw caution to the wind and opted for the Jr. rib plate at The Iron Works, conveniently located around the corner from the Austin Convention Center. It was a tasty mess, just like I like it. While we were wandering around La Boqueria in Barcelona, we spied this strange looking fruit. Bright pink with large scales on the outside, cut in half to reveal white flesh flecked with what look like tiny black seeds. 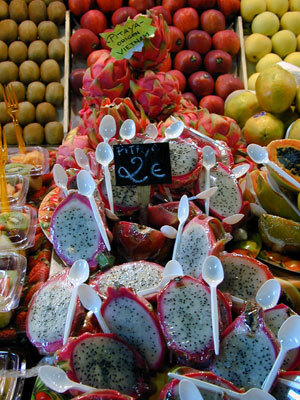 Wena kindly informed me that these are Dragon Fruit, or Pitaya. It's part of the cactus family, grows in tropical regions, and apparently is very tasty. More information and photos of Pitaya. Back from Barcelona and busy as ever. I've uploaded a couple of photos from La Boqueria to hold you over until I can update properly (probably tonight or tomorrow).